London, UK – Cannybots, the programmable smart toy robots that can be controlled from a smartphone or tablet, and that get kids excited about robotics, today launched on Kickstarter. Cannybots are smart toy robots that encourage children to play and spend time together, rather than spending their days in front of screens playing virtual games online. Cannybots teaches kids about robotics, programming, design and 3D printing while they are playing. Children receive a construction kit for their Cannybot containing all the parts and detailed instructions to build their robot. They can then be programmed and controlled from phone, tablet, PC or a Raspberry Pi. To introduce children to programming, the Cannybots team created a simple and intuitive app called ‘CannyTalk’. The app uses a syntax-free programming environment that works like a friendly chat tool. Using the app anyone can program the Cannybot using plain English. The complex Artificial Intelligence (AI) based engine behind CannyTalk is developed in association with researchers from the Computer Science department at the University of Cambridge in the UK. 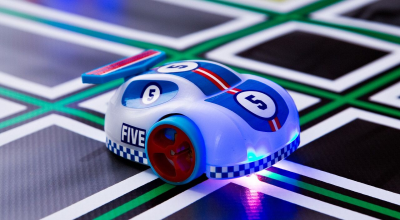 Once built and programmed, the bots can be used in a number of play scenarios such as high speed racing, time trials, sumo-wrestling, jousting and puzzle-solving. Apps and printable tracks are available for each game. 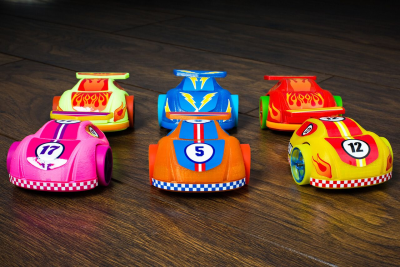 Children can also design new car bodies using free, easy to use, browser based CAD software from Cannybots’ partner Autodesk. The designs can be then easily 3D printed using any home 3D Printer. The current version of Cannybots is already very popular and is being used in over 20 schools in the UK and Europe. Pre-orders start as low as $89 for an early bird special and will be shipped in time for the holidays. Cannybots are smart toy robots that can be controlled and programmed from a phone or a tablet. This engaging toy brings kids play time out of their tablets and back into the real world. It also introduces kids to Programming, 3D Printing and Robotics through play. Cannybots can be used in a large number of play scenarios, such as –Racing, Sumo Wrestling, Jousting, Maze solving and other puzzle games. There is a dedicated phone app and track design for each game play. Customer can print the tracks at home or use the large format tracks that we supply. It is also possible to make a large track by printing segments of A4 sheets. The bots work by following black lines and colored mark printed on the track. Cannybots can be programmed from a Phone or a Tablet using a simple, intuitive app called CannyTalk. It is a Natural Language based programming interface using which you can program the robot in plain simple English. It eliminates the complex Syntax found with other programming languages thus making it easy for kids to get started. Cannybots designs are open source, free and 3D Printable. You can easily customize the design using free, browser based CAD software from our partner Autodesk. The customized designs can be 3D printed using any ordinary home 3D printer.